Liberace in his piano themed pool. 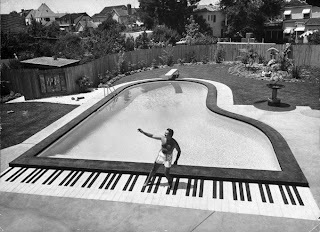 The blog Curbed Los Angeles added an awesome post the other day mapping out some of Liberace's "Razzle-Dazzle" homes in Los Angeles, Palm Springs and Las Vegas. Complete address information and photos like the one above showing Liberace in his piano-themed house in Sherman Oaks can be found in the Curbed post here. As one might expect, all of the homes are theatrical, kitchy and fun! 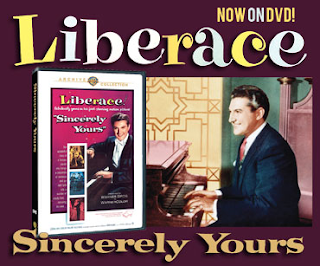 According to an interview with Michael Douglas at the Television Critics Association Winter Press Tour, Debbie Reynolds, who plays Liberace's mother in this movie, was personally acquainted with the real Liberace and appeared as a guest on his variety show. Douglas also said that when he was younger, his father, Kirk Douglas, had a Palm Springs home down the street from one of Liberace's homes, and although Michael Douglas never met Liberace, he did occasionally see him in the neighborhood. Michael Douglas was older at the time of filming than Liberace was when he died. Although played by a 42-year-old Matt Damon, Scott Thorson was only a teenager when he met Liberace, and still only in his twenties when Liberace died. The location which served as Liberace's Las Vegas mansion is actually the Los Angeles home of Zsa Zsa Gabor and Frederic von Anhalt. Liberace's Beverly Hills penthouse was shot on location in the actual apartment space. The art department was able to recreate the apartment's original black and metallic look based on photos provided by the owner (who was a huge Liberace fan). And just recently, the Warner Archive released the Liberace film Sincerely Yours (1955) on DVD. The DVD can be purchased through the Warner Archive here or rented through ClassicFlix here. Above is a preview clip of Sincerely Yours from the Warner Archive. I didn't get to watch the HBO film but hopefully will get to catch it soon. I totally remember Liberace's appearance on The Muppet Show. What a great combination - Muppets and Liberace!